You sometimes need to insert chemical formulae and structural presentations in texts and you then create them in an external graphics program, which is quite tedious. 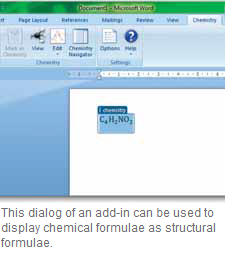 The formula editor integrated in Word is suitable for chemical formulae only to a limited extent. The Cambridge University, in collaboration with Microsoft, has developed a new add-in that integrates a special editor for chemical formulae in Word in a similar manner. You can download a free version from http://goo.gl/XT3r. INSTALL ADD-ON: Unzip the ZIP folder in a new folder on the hard disk and start ‘setup.exe’. If required, the tool updates the Visual Studio tools for Office during installation. In such a case, restart the setup for the upgrade and run it again - start Word. Confirm the integration of the add-on by clicking ‘Install’. This adds a new entry ‘Chemistry’ in the main menu of the menu bar. Then click the Office button, select the command ‘Word Options’ and then the category ‘Add-ins’. In ‘Active Application Add-ins’, enter ‘Chemistry Smarttag’. Now select the setting ‘Smarttags’ right at the bottom in ‘Manage’ and click ‘Go to’. In addition to the relevant upgrade, also activate the buttons ‘Provide text with smarttags’ and the ‘Display smarttag action buttons’ here. Confirm the dialog with ‘OK’. INSERT FORMULAE: Start with the text input of the English name of the desired link. A smarttag usually identifies the name and provides suitable options. Select the command ‘Concert to Chemistry Zone’. Then select the created module and click ‘View’ in the multi-task bar. Select one of the existing views and confirm with ‘OK’. ‘2D’ gives you a graphical presentation of the structural formula. If a structural formula is selected, clicking ‘Edit’ provides the option of modifying the graphic as desired. The add-in is based on the CML (Chemical Markup Language). This contains links on the basis of compound IDs. They can be used as follows: Open http://goo.gl/u770. Enter the requested name there, e.g. ‘Carbon dioxide’ or ‘Methanol’ and start the search. If there are no direct hits, follow the alternative suggestions such as ‘carbon dioxide’. The search result shows the English term ‘carbon dioxide’ from the database as well as the relevant compound ID ‘280’. Use this name so the smarttag in Word can identify the link automatically; or click ‘From file’ under ‘Import’ in the multi-task bar. Navigate to ‘C:\Programs\Chemistry Add-in for Word\Smart Tag’. Then select the CML file with the desired CID and click ‘Open’.